As many readers are aware, a small, newly released Norwegian double-blind study found that rituximab—an IV medication used to treat lymphomas, leukemias, organ rejection and refractory arthritis—is also very effective in treating ME. And now a bigger rituximab study is under way in Norway. In my five minutes testifying before the Chronic Fatigue Syndrome Advisory Committee (CFSAC) meeting last spring, I asked for, among other things, a meeting with Dr. Tony Fauci, head of the National Institute of Allergy and Infectious Disease (NIAID), the same Tony Fauci who has said many times that ME is a psychological disease. I’d love to report that the two of us met over saketinis, where we chatted sotto voce about ME and then braided each other’s hair, during which time the NIAID director finally had the light-bulb epiphany patients have been dreaming about for decades: ya know, that ME is a devastatingly serious and sometimes fatal disease. Alas, however, I heard bupkas from Dr. Fauci. As Gordon Gekko might say, summer is over and business is business. I’ve been hearing the usual fretting about the toothless CFSAC committee meetings, the semi-annual snorefest of how to accomplish absolutely nothing while spending beaucoup taxpayer dollars, as suspicious guards eye patients who can barely move as if the patients are Al Qaeda operatives and the guards are Claire Danes in Homeland. There has been some debate where to hold the CFSAC protest this year, and I say wouldn’t it be great if people could protest everywhere—the hotel where the meeting has been moved, Health and Human Services, at the homes of all government officials involved in the disease, from CDC’s Dr. Beth Unger on up. But since that’s not feasible, in my view a protest outside Tony Fauci’s office is what’s needed most to shake things up. After all, he’s the one who dictates policy; Beth Unger et. al. comprise merely the foot-soldier battalion. As I’ve blogged before, ACT UP patients addressed Fauci’s indifference to HIV/AIDS 25 years ago; for a time, activist Larry Kramer affectionately dubbed Fauci a “murderer.” Those strong-arm tactics changed everything for the better. Fauci was just one of the government officials ACT UP gutted and served with fava beans and a nice Chianti. Dr. Stephen C. Joseph, the Health Commissioner of New York City from 1986 to1989, was another. After proposing that physicians be required to report HIV/AIDS patients to the state, Joseph became a favorite target of ACT UP. According to the Wall Street Journal, he also reduced by 50 percent the estimate of the number of New Yorkers carrying the HIV virus, a momentous shift ACT UP believed would result in diminished funding. ACT UP staged sit-ins in Joseph’s office, tortured him with telephone calls, marched outside his house and threw paint on his house. And, in keeping with Godwin’s Law—in which the probability of a comparison to Nazis/Hitler in a heated debate eventually approaches 1—ACT UP denounced Joseph as a Nazi. When you stand up to bullies, they back down. Eventually. Most recently, we’ve seen this caving in occur with the Occupy Wall Street protests, as the republicans began dialing back their disdain and even showed on-camera sympathy as the number of protestors and media coverage grew. Which brings me back to rituximab. Pushing for a study on rituximab now is paramount for four reasons: one, the drug appears to work for ME, which after 30 years still has no drug to treat it; two, drug approval for a disease garners respectability for the disease—and if there’s one thing this disease needs it’s respectability. Three, figuring out exactly how rituximab works on ME may shed insight into the immune abnormalities in the disease and generate more research and effective treatments. And four, at circa $20,000 a year, the drug is prohibitively expensive and insurance won’t cover it for most ME patients, unless they also happen to have cancer, an organ transplant or arthritis. On the down side, hobbling pieces of the immune system with a drug like rituximab may prove more Band-Aid than magic bullet. It may thrust ME into the autoimmune world that quashes symptoms with immune suppressors rather than address the underlying disease process. That’s the world in which lupus, MS and rheumatoid arthritis currently reside. And it’s also possible that if enough ME patients improve on the drug, no one will devote much energy to searching for a cure—not that anyone does now, but one can always hope. Moreover, rituximab isn’t benign. It can be toxic to the kidneys and leave patients vulnerable to infections and cancers, as it depletes the B cells, key players in the immune system. Most problematic is that it can, in rare instances, reawaken the JC virus, which infects most people in childhood and is benign in healthy people, but in rare instances in immunocompromised patients it can attack the brain and cause progressive multifocal leukoencephalopathy (PML), which leads to death or brain damage. The best way to detect the presence of the JC virus is through spinal-fluid PCR and an antibody test prior to beginning therapy. However, negative tests don't ensure that patients won’t develop PML due to the drug. For now, it's the jumbled luck of the draw. All that being said, there’s always a risk-reward ratio for medications, and for some patients rituximab may restore life to their lives. After a disappointing summer, rituximab is huge news and certainly worthy of a bigger study. How do you convince a disinterested drug company or the disinterested U.S. government to conduct a rituximab study on ME? Perhaps this would work: Patients could contact Genentech, Hoffman-LaRoche, Chugain Pharmaceuticals, their congressman and Tony Fauci with a clear and singular message: ME patients need and want a drug study on rituximab. Period. That could be a key message at the November CFSAC meeting and at the demonstration outside Tony Fauci’s office. Tony Fauci, help ME patients. Fund a rituximab study. 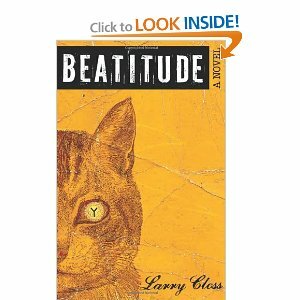 Rebel Satori Press has just published the novel Beatitude by writer extraordinaire (and my good friend) Larry Closs. The book has nothing to do with ME, but it is a great read. You can purchase the book on the CFS Central Amazon.com store. Click on the book's yellow book jacket on the right-hand column on this page. New York City, 1995: Harry Charity is a sensitive young loner haunted by a disastrous affair when he meets Jay Bishop, an outgoing poet and former Marine. Propelled by a shared fascination with the unfettered lives of Jack Kerouac and the Beat Generation, the two are irresistibly drawn together, even as Jay’s girlfriend, Zahra, senses something deeper developing. Reveling in their discovery of the legendary scroll manuscript of Kerouac’s On the Road in the vaults of the New York Public Library, Harry and Jay embark on a nicotine-and-caffeine-fueled journey into New York’s thriving poetry scene of slams and open-mike nights. An encounter with “Howl” poet Allen Ginsberg shatters their notions of what it means to be Beat but ultimately and unexpectedly leads them into their own hearts where they’re forced to confront the same questions that confounded their heroes: What do you do when you fall for someone who can’t fall for you? What do you do when you’re the object of affection? What must you each give up to keep the other in your life? Beatitude features two previously unpublished poems by Allen Ginsberg. CFS Central: The Chronic Fatigue Initiative website states, “CFI will offer grants to fund new research guided by five or six general hypotheses formed by a scientific advisory board of leading scientists and clinicians.” Will this research be started immediately or down the road? Have these hypotheses been decided on? If so, what are they? Chronic Fatigue Initiative: Now that the epidemiology study, the cohort recruitment and the pathogen discovery programs have been organized, we are beginning the recruitment of leading scientists and clinicians for the scientific advisory board, which will be funded through the CFI Mechanism of Illness grant program. We plan to finalize appointments and have our first meetings to develop some general hypotheses over the next six to nine months. We expect to publish requests for proposals shortly thereafter. All of this work will be funded through the Mechanism of Illness grant program. CFS Central: On the CFI website it says that the “Pathogen Discovery and Pathogenesis Study” will begin following cohort recruitment, creation of the bio-bank and population of the database. Can you give me an idea how long recruitment and creation of the bio-bank and database will take? Can you give a ballpark figure on how long the pathogen study will take? Chronic Fatigue Initiative: We expect to recruit cohort subjects over the next 12 months. The pathogen discovery project will begin within three months following completion of recruitment, as the first bio-samples are processed. We plan to have results from the pathogen discovery project within the next 18 months. CFS Central: Would you explain what other research the CFI will undertake over the next year to two years? Chronic Fatigue Initiative: We will focus future research efforts through the Mechanism of Illness grant program described above. CFS Central: What are the short-term goals of the CFI? What are the long-term goals? And what’s the time frame for both? Chronic Fatigue Initiative: CFI’s goal for the next three years is for the CFI-sponsored researchers to complete and publish the results of the epidemiology study, the cohort recruitment program, the pathogen discovery program, and the various studies funded by the Mechanism of Illness program. We expect that the results of this comprehensive strategy will attract attention and greater funding from larger research foundations and philanthropic organizations. CFS Central: Figuring out the cause of the disease is crucial for treatment but has proved elusive. Another piece of the puzzle that’s probably easier to figure out and could potentially lead to treatments quickly is an understanding of the cellular pathophysiology of post-exertional malaise (PEM). For many patients, crashing after activity is the most problematic aspect to the disease. There has been some research on ME/CFS patients’ diminished VO2 max levels—the threshold at which the body goes from aerobic to anaerobic—as well as gene-expression changes after exercise. But researchers still don’t understand what exactly happens to patients 24 to 48 hours after activity, and beyond. Do the muscle enzymes, for instance, become abnormal? Does the body produce too much lactic acid? Or is glucose not reaching the muscles? That kind of thing. Will the CF Initiative examine the PEM problem? Chronic Fatigue Initiative: PEM is a medical issue that we are aware of. At the recent IACFSME [International Association for CFS/ME] conference, Dr. Betsy Keller and Dr. Christopher Snell made compelling presentations of PEM. The scientific advisory board of the Mechanism of Illness grant program will consider PEM among other issues in determining the four or five general hypotheses on which to focus. CFS Central: Dr. Joe DeRisi of the University of California, San Francisco, has devised a ViroChip. It’s a DNA microarray on a slide that includes every virus ever discovered—about 22,000 altogether. It works like this: DNA and RNA from a patient are tagged with a fluorescent dye and placed on the chip. If there’s a match between what’s on the chip and the patient’s sample, a particular spot on the chip glows. Using computers, DeRisi can look for thousands of viruses at one time. What’s the difference between Columbia University’s techniques to uncover viruses and DeRisi’s? Why has the CFI decided to use Columbia’s technique? Chronic Fatigue Initiative: Representatives of CFI met with a number of virologists when we were establishing the pathogen discovery study. Dr. Lipkin was selected based on his unquestioned expertise, high-quality team and superior track-record of pathogen discovery. CFS Central: What’s your relationship to the Hutchins family? How did the Hutchins family become interested in ME/CFS? Chronic Fatigue Initiative: The Hutchins family approached Scott Carlson 18 months ago about organizing and implementing CFI’s comprehensive strategy using business principles and accountability to accelerate medical research. The Hutchins family has several friends who suffer from CFS. CFS Central: There are many definitions of ME/CFS, which results in confusion and causes a huge problem because researchers aren’t studying the same cohorts. Dr. Leonard Jason of DePaul University has studied the definitions and found that CDC’s definition results in a cohort of mostly depressed patients, not patients with the neuroimmune profile of ME/CFS. The three most commonly used ME/CFS definitions are the Fukuda definition; the revised Fukuda (AKA Empirical) used by CDC; and the Canadian Consensus Criteria, which is what most patients and ME/CFS-literate physicians endorse. The newest definition, Carruthers ME International Consensus Criteria, is basically a revise of the Canadian Consensus Criteria. What ME/CFS definition will CFI use in its studies? Chronic Fatigue Initiative: The CFI-sponsored cohort recruitment protocol uses the updated CDC definition and the Canadian Consensus Criteria to identify well-characterized subjects. We also noted the new definition presented at the recent IACFSME conference. CFS Central: On the forums, some patients have voiced concerns about the CF Initiative because the website includes the Centers for Disease Control’s treatment protocol of cognitive behavioral therapy (CBT) and graded exercise therapy (GET). In reality, CBT is not significantly effective for patients with bona fide Chronic Fatigue Syndrome, and GET can be very harmful, resulting in relapses that last for days, weeks, months or even years. In addition, the CFI website states that according to the National Institutes of Health, “the main symptom of CFS is extreme tiredness (fatigue).” Seabiscuit and Unbroken author Laura Hillenbrand characterized it this way, “This illness is to fatigue what a nuclear bomb is to a match. It’s an absurd mischaracterization.” Profound exhaustion is closer to it. Unfortunately, CDC and parts of the NIH have perpetuated the “tiredness” misinformation for decades. Moreover, other symptoms of ME/CFS are just as problematic, if not more so, particularly the neurocognitive problems, as well as pain, PEM, and autonomic dysfunction, which makes it difficult or even impossible to sit or stand. Would the Chronic Fatigue Initiative consider amending the CBT/GET information and the description of ME/CFS on its website? Chronic Fatigue Initiative: CFI will continue to update its website as the science develops, including the definitions of the disease. CFS Central: The other concern patients have is the name Chronic Fatigue. The patients contend that the name Chronic Fatigue promotes the misrepresentation of the disease—i.e., studying patients who are only tired and/or depressed but who don’t have ME/CFS. Examining the wrong cohort has been a big problem over the years, particularly with the psychiatric school headed up by psychiatrist Simon Wessely in England, and at CDC here in the U.S. This muddying of the cohorts often results in findings that are meaningless. It’s like doing a study on Alzheimer’s disease but recruiting patients who are tired and depressed. Patients and researchers had the opportunity to change Chronic Fatigue Syndrome’s name about 10 years ago, but CDC and the CFIDS Association nixed it. Treatments and research have suffered as a result, and the social stigma of having a terrible disease with a trivial name has continued. The largest patient discussion groups, Phoenix Rising and ME/CFS Forums, have discussed that they’re unhappy with the name Chronic Fatigue Initiative. They’d prefer the ME Initiative. Would you be open to dialoguing with patient groups about the name? Chronic Fatigue Initiative: Like many organizations, Chronic Fatigue Initiative developed its name based on common usage among the scientific, clinical, and patient communities, as well as the general public. We decided not to use the word “syndrome” because we believe the illness to be a disease—far beyond a syndrome. Through the CFI-sponsored research, we hope to clearly define the causes of the disease.